Applaws Cat Food is a natural and tasty dry food that is packed with chicken meat. The food is formulated specifically for adult cats. This food is free from grains, which supports its digestion by your cat. Applaws Cat is available in bags of 400 grams, 2 kg and 7.5 kg. Price reduction! 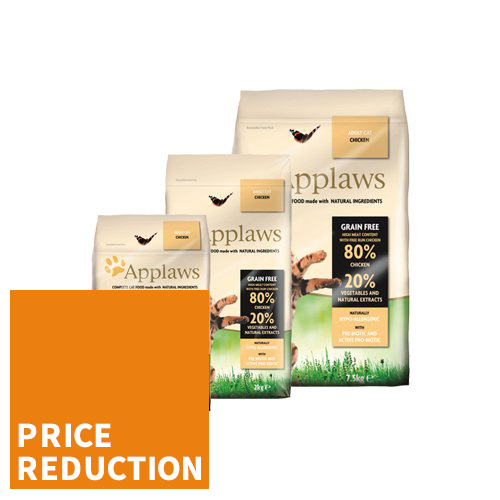 The 2kg and 7.5kg bags of Applaws dry food have been permanently reduced in price. Applaws formulated this dry food specifically for adult cats. The food contains at least 75% lean chicken meat which is supplemented with potato, beet pulp and salmon oil. This last ingredient is a natural source of Omega 3 and 6 fatty acids. These nutrients contribute to the brains and nervous system of your cat. Applaws Adult is free from grains, which helps to reduce stress on the kidneys and liver of an adult cat and helps to reduce the chance of food intolerance. The beneficial bacteria added to the food contribute to a balanced gut flora. Fresh fish, fresh meat and no artificial colours, scents or flavours; Applaws only uses natural ingredients originally meant for human consumption in the production of this cat food. The Applaws range consists of 75% fresh fish or fresh meat. This results in dry food and wet food that is rich in vitamins, minerals and Omega 3 and 6 fatty acids, which support your pet’s health. Applaws Cat Adult is available in bags of 400 grams, 2 and 7.5 kg. Dried chicken (65%), minced chicken (17%), potato, brewer’s yeast, beet pulp, chicken broth (1%), salmon oil, vitamins and minerals, dried egg, cellulose fibre (0.03%), sodium chloride, calcium carbonate, seaweed/kelp, cranberries, DL-methionine, potassium chloride, yucca extract, citrus extract, rosemary extract. Have you used Applaws Cat Food - Adult - Chicken before? Let us know what you think about this product.